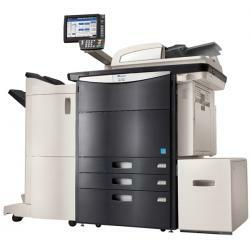 The Copystar CS 750c Color Multifunctional System > encompasses the consistent high image quality, robust performance and unsurpassed reliability that fast-paced business environments demand. Designed to become an essential partner to your customers’ operation where color documents play a critical role, the CS 750c features a sleek design on the outside and innovative imaging technology on the inside. At highly productive output speeds of up to 75 ppm black and 65 ppm color the powerful combination of user-friendly operation, flexible paper handling and advanced product configuration assures superior document output. That is the confidence of knowing that your customers’ document imaging needs are successfully achieved, the first time, and every time. That’s the Copystar CS 750c.